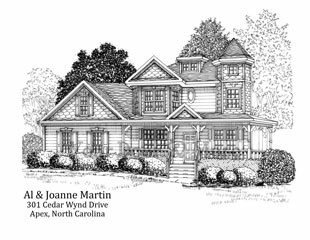 Scott’s Mill Subdivision in Apex is a unique area. The homes are all so different from each other. The builders must have used a ‘master plan’ when deciding what went where. The layout is stupendous. There are patio homes, single-family homes and condos. The flow is all off the main street, which does a loop. I have to be careful when driving, as I am so distracted, looking at all the assortments of homes. Joanne & Al’s home is a true Victorian, with dental molding, a turret and fish-scale siding. I have not toured the home but from the outside, its an illustrator’s dream!